If you could play Mario Kart in the real world, you know you totally would. 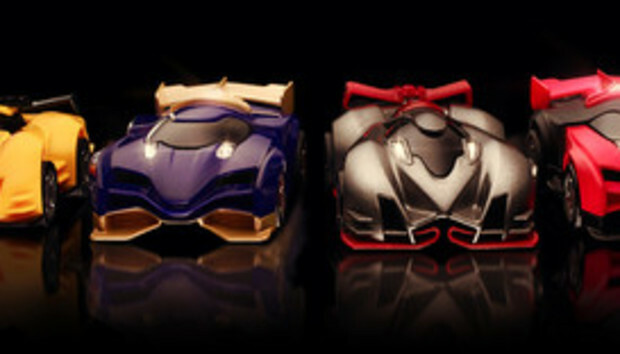 Anki Drive is kind of like that--its little toy cars race around a real track on your living room floor, lights blinking to signify that they're firing weapons at each other, controlled by you and your iPhone. But as I learned during many laps in the Anki booth at CES 2014 with cofounder and CEO Boris Sofman (he's only got a Ph.D. in robotics from Carnegie Mellon, no big deal), Anki Drive is no mere toy. First of all, the cars are really little robots--they've got artificial intelligence, they sense the track they're racing around 500 times a second, and they can drive themselves autonomously. Any of the four cars can be controlled by humans or the AI, and they know not only where they are, but where the other cars are too. Not gonna lie: Seeing an AI controlled car came gunning right for me, adjusting itself as I futilely tried to evade it, caused a delightful shiver in the nerd center of my brain. In fact, the cars behave so smartly that there's virtually no learning curve. I'm normally terrible at driving games (except Mario Kart for some reason), but the Anki cars don't need my help driving. They whiz around the track on their own, letting me concentrate on the battle--tilting my iPhone to switch lanes and cut off my opponents, and using onscreen controls to speed up, slow down, and fire guns and unlockable weapons. Sofman calls the cars "characters" since they have different attributes like energy and damage resistance (as well as names and Transformer/Ironman-like looks), and as you level up a car's capabilities and weapons, that information is saved to the car itself. So if you swapped cars with a friend, the driving experience would be different. I had a super fun time playing with Anki Drive--so much so that I almost hated to ask what the game would send me back. I mean, autonomous robots, you know? But the starter kit, with two cars and the track, is $200, and the other two cars are $70 each. Of course, every driver needs an iOS device (iPhone 4s, iPad 3, 5th-gen iPod touch, or newer, including iPad mini) too. For that scratch, it's too bad these robots can't also, say, vacuum my floor as well--OK, just kidding. But the value would increase if and when Anki rolls out more games besides the main Battle mode. Sofman says they're working on a racing game next and considering producing an SDK, which is how Sphero got to more than 30 compatible apps. Anki Drive is available in Apple Stores, and online. Start your tiny robot engines.